The second edition of the Awards held under the Patronage of H.H. Hamad bin Mohammad Al-Sharqi, Member of the Supreme Council and Ruler of Fujairah and will be presented on Sept. 17th in Fujairah. Fujairah (UAE) – Martin Fraenkal, President, S&P Global Platts, the world’s largest oil price reporting agency, and Ibrahim Al-Buanain, President & CEO, Saudi Aramco Trading Co., trading arm of the world’s largest oil exporter, led the International Selection Committee of the 2018 New Silk Road CEO of the Year Awards, alongside five other industry leaders from the energy Trading, Shipping, Storage and Refining sectors. 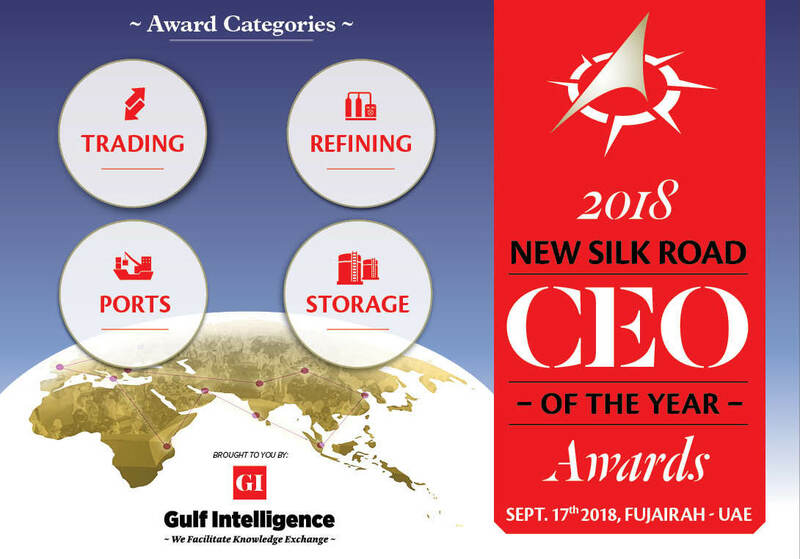 The New Silk Road CEO of the Year Awards were conceived to recognize Chief Executive Officers with an outstanding record of achievement in the advancement of the international Energy industry’s interconnectivity across Asia to the Middle East. Much of this economic reintegration from the Arabian Peninsula to the massive consuming populations of Asia is built on a foundation of physical energy: Trading – Refining – Ports - Storage, and hence the Awards are presented in these four categories. “Given that Fujairah has been an active trader across these oceans for 500 years, it is only fitting that the celebration of these 21st century pioneering industry leaders be hosted by this global trading hub,” said Sean Evers, Managing Partner, Gulf Intelligence, which is producing the awards campaign under the Patronage of H.H. Hamad bin Mohammad Al-Sharqi, Member of the Supreme Council and Ruler of Fujairah. “These CEOs are spearheading the transformation of energy trading across this ancient Silk Road route, which is literally changing the flow of world energy trading,” he said. 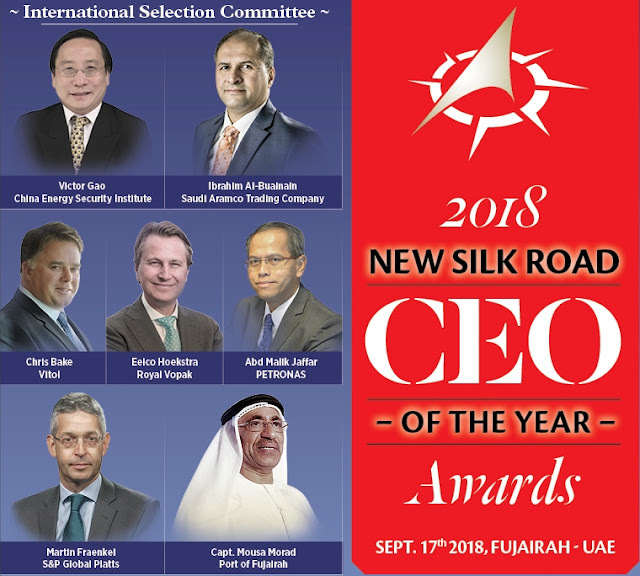 The New Silk Road CEO of the Year Awards, founded in 2017 in partnership with the Port of Fujairah, strives to ensure that the worthiest nominees globally are identified for their outstanding record of accomplishment in their category. To achieve this, a group of renowned industry leaders, are invited annually to join the International Selection Committee to independently nominate and evaluate the final nominees based on the following four criteria: Trading, Refining, Storage, and Ports. Ibrahim Al-Buanain and Martin Fraenkal were joined on the 2018 International Selection Committee by Eelco Hoekstra, Chairman of the Executive Board & Global Chief Executive Officer, Royal Vopak; Victor Gao, Chairman, China Energy Institute; Chris Bake, Member of the Executive Committee, Vitol; Abd Malik Jaffar, Regional Director, PETRONAS Subsidiaries Middle East, and Capt. Mousa Murad, Managing Director, Port of Fujairah. “The New Silk Road CEO of the Year Awards are an important commitment in recognizing inspirational individuals for their work along with an important trade route, of the Africa-Middle East-Asia corridor. The Awards highlight leaders who are spearheading the transformation of the global energy trade flows” said Abd Malik Jaffar, Regional Director, PETRONAS Subsidiaries Middle East. China’s One Belt One Road Initiative (OBOR) is set to be the world’s largest platform for economic cooperation, trade, and financing collaboration. Reaching more than 60 countries and 4.4 billion people with a combined GDP of $21 trillion, OBOR provides the potential to redraw the global energy map through investment and development of energy infrastructure and re-emergence of global trade routes. The rise of the Arab world, China and India are part of the same story, once historic trading partners via the old Silk Road. It isn’t a coincidence that Arab traders have returned to Asia while China is leading an Asian wave of nations that are fast regaining their share of the global economy. The 2018 Winners will be presented their Awards at a Gala Dinner event held in Fujairah, UAE on September 17th, 2018 on the eve of the 8th Gulf Intelligence Energy Markets Forum.